Djimon Hounsou doesn't want you to know, but he's afraid of scary movies. So it's a bit odd that the actor's latest film, The Vatican Tapes , falls squarely in the supernatural-thriller genre. The movie, out now, follows the demonic possession of 27-year-old Angela Holmes (Olivia Taylor Dudley) and her subsequent exorcism by a Vatican cardinal (an eerie Peter Andersson) and a local priest, Father Lozano (Michael Peña, now better known as “the guy who stole Ant-Ma n from Paul Rudd"). Hounsou plays another man of God — the Vicar Imani — but stays suitably distant from the action, studying gritty, found-footage recordings of Angela's descent into evil from his citadel. The Vatican's review of these recordings eventually unearths the fear that, rather than simply a young woman possessed, Angela is actually the medium of the Antichrist. "It truly is an enigma," Hounsou tells Bustle. "We're in the ultimate battle between good and evil." Within its first half hour, The Vatican Tapes seemingly shows all its cards: Satanic possession; a 40-day coma (of profound Biblical significance, as the characters don't hesitate to point out); and the cause to violence (Angela seems to prompt a detective to gouge out his eyes with shards of lightbulb, and wreaks havoc in a hospital's group therapy session). It's about as straightforward an exorcism as they come — on the surface. As the story progresses, it becomes apparent that there may be something more at stake than a young woman possessed. Angela, played with alternating cold calculation and paralyzing fear by Dudley, undergoes a futile fight for her self, but the Devil seems already to have taken control. She's not facing any old demon — it's the king demon. Hounsou's Vicar Imani watches all of this unfold from afar, through an array of recordings he accesses at the Vatican. It may sound far-fetched, but the actor believes that there's a definite possibility that something like these tapes could exist in real life. "I bet there’s a great number of things in store in the Vatican that we don’t know about," he says. His Vicar Imani is the only character with a totally macroscopic view of the action, and his interludes show an Earth gradually devolving into chaos. Hounsou says the character began as a minor role that grew as production progressed. "We developed the character as well as the story," he says. "Just kind of on a daily basis, we were trying to make it better." Hounsou, who shares his character's belief in demonic possession, studied tapes of Vatican cardinals to inform his role, as well as drawing on his Catholic roots growing up in Benin. "It's a continent that's extremely religious," he says of his native Africa. He grew up with an awareness of the occult, and of realms that lie beyond what can be seen or felt by the human body. 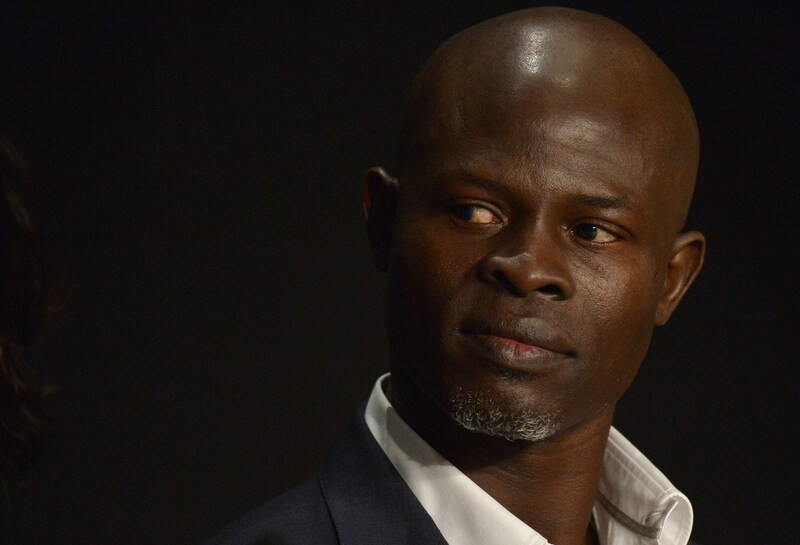 "There is a world around us that feels empty, but it's far from being empty," Hounsou says. The Vatican Tapes may be one of the actor's darkest roles yet, which is truly saying something; the twice-Oscar nominated star (for In America and Blood Diamond) has filled his impressive career with dramas. He got his "big break" in 1997's Amistad after years of work as both an actor and a model (remember those Calvin Klein ads?). Hounsou, who immigrated to France at age 13, dropped out of school to pursue acting not long after his arrival in Europe, a decision that caused his family to kick him out. Yet the shock ended well for him, he says, as he matured from "getting out from the comfort between the legs of your mom and dad, the comfort of their homes." In the years since, Hounsou has since gravitated towards period pieces, including Gladiator, Four Feathers, and next year's King Arthur: Knights of the Round Table . Still, he's remarkably versatile, appearing in genres ranging from action to historical drama to animation to sci-fi. The Vatican Tapes is the actor's first horror film, though he reports that he still hasn't seen the finished product. "The amount of negative vibration that comes out of that is immense," he says of the horror genre. "I don’t have the nerves for those scary movies." In terms of its production, The Vatican Tapes is as respectable as any of Hounsou's best dramatic work. In 2009, the film appeared on the Black List, the ranking of the best unmade scripts in Hollywood. It was originally proposed as an exclusively found-footage thriller (one of the oldest and most well-trodden scary movie tricks), but eventually morphed into a character-driven narrative that incorporates a few remaining nods to its Black List roots. The movie's complexity is what sets The Vatican Tapes apart from its forefathers like Rosemary's Baby and The Exorcist, and it makes an already spooky premise all the more compelling. Though it presents the footing for a simple exorcism, the end of the film is pretty ambiguous (spoilers ahead! ); after a deep coma and failed exorcism that reduces her father, boyfriend, and both priests to ash, Angela enters the limelight performing miraculous and widely publicized healings. Hounsou, as Imani, surveys her appearances in arenas and on talk shows from his stronghold and declares her the false prophet — perhaps also declaring, if all goes well for the film's release, the start of a franchise. It might be time for the actor to get over his fear of scary movies, because The Vatican Tapes might just be the start of something big.